It’s just three days until a month of AW18 shows draw to close, but there’s still plenty more to see in that time. Today marked one of the most anticipated: Balenciaga, which showed its first collection since Demna Gvasalia announced he would be unifying womenswear and menswear. Spoiler alert: there were fake boy band tees, tote bags with puppies, and some extreme silhouettes, even by Demna’s standards. Here’s what went down. 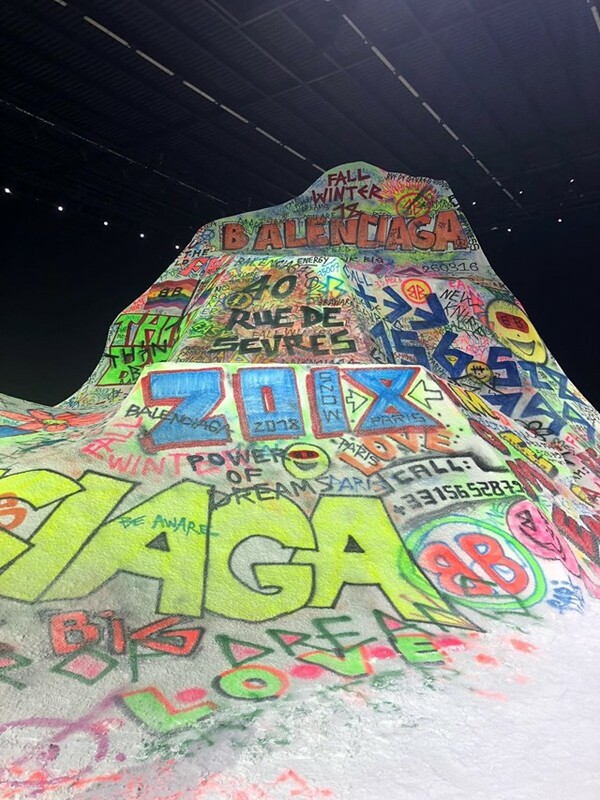 This season, Demna and co built a giant snowy mountain in the industrial estate venue which was covered in graffiti featuring phrases from past collections including “think big” and “the power of dreams”, as well as things like “no borders” and “2-gether”. And at the very top, painted on the peak, was one word: Balenciaga (obviously!). Like that bit in Friends when Joey puts every item of clothing he owns on. The collection was designed with dressing for extreme weather in mind, as layer upon layer is considered and added to the body: starting with thermal pieces that sit close to the skin and progressing finally to coats and jackets, “aesthetically, I was inspired by the snowboarders of the early 90s” Demna told us post-show. Some of the looks sent down the catwalk were made up of upto nine pieces of outerwear that were fused together. It was the typical Balenciaga silhouette amplified by ten. A number of the models wore skin-tight Lycra and velvet tops in lurid, highlighter colours, the sleeves of which ended in gloves, prompting the question: can you still text in those? Elsewhere, trousers were tucked into boots and shoes as some looks ensured no skin was on show. With the World Food Programme (WFP), the largest humanitarian organisation fighting hunger worldwide. The charity’s logo appeared on hoodies, caps, and bumbags, along with its slogan ‘saving lives, changing lives’. As well as a $250,000 donation to the charity, a 10% of the proceeds of sales from the items will go directly to the WFP.